For probably the first time in history, a party will take place in zero gravity, headlined by some of the biggest DJs in the world. Dubbed ‘The World’s Smallest Nightclub’ World Club Dome Zero Gravity will launch on 7 February, 2018 in cooperation with FRAPORT – Frankfurt Airport. The only way to win a ticket on board the flight is to send a 20 second video application explaining why you deserve to take part in this once-in-a-lifetime experience. Be aware though, only two winners (one male and one female) will be selected from each continent, including an additional two winners each from Germany and India. The specially converted A310 aircraft, used by the European Space Agency (ESA) for astronaut training flights, will take off from Frankfurt Airport on 7 February. 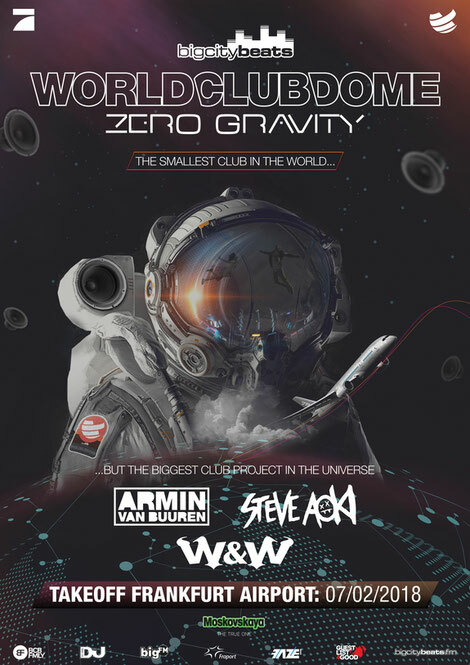 The flight will last a total of 90 minutes, with headliners Armin van Buuren, Steve Aoki and W&W providing the soundtrack to possibly one of the most unique party experiences ever conceived. Partygoers and DJs will float together in weightlessness - an experience usually reserved for astronauts. To be considered, entrants must share their 20-second application on social media with the hash tag #wcdZeroGravity as well as at the official competition site. The first phase of finalists will be announced 12 January, with the jury choosing the Top 20 people (10 male and 10 female) from each continent. The final two winners from each continent will then be decided by an online vote, combined with a jury, and will be announced on 19 January. The World Club Dome concept was founded five years ago in Frankfurt and has apparently become one of the biggest of its kind in Germany, dubbed the ‘biggest club in the world’ covering over 700,000m² with 20 gigantic stage designs, 200 headliners and the largest laser show on the continent, combining the glamour of a club with the open-air feeling of a festival. Since its inception, the concept has expanded to lead a 2000-capacity cruise around Europe and moved into South Korea, which apparently ‘attracted 100,000 revellers in 2017’. As part of its series of events, they also launched the ICE Club-Train, the "fastest club in the world" in 2015, a high-speed train travelling at 320km/h equipped with international DJs and partygoers. In 2015, WCD also announced the Club-Jet, the "highest club in the world" taking partygoers clubbing in a Boeing 747 sound-tracked by some of the top DJs in the world.